I have been doing a lot of deep sighing this week, lots of deep sighs. The world lost an amazing mother, woman, inspired leader. Mariah Fenton Gladis, Mother, wife, grandmother, was one of the most well loved women, and deeply skilled, in the Psychological speciality known as Gestalt Therapy. Not only that, but she was a 34 year survivor of Lou Gehrig’s disease. When she was given the diagnosis 34 years go…on the same day her fiance, asked her to marry him, she was only given a one to two year window of life. Mariah not only defied all the odds, she went on to marry, give birth to two amazing sons, and, along with her husband Ron, lived an extraordinary life together. WhIle I had heard of Mariah before, I really came to love her in a new way, when she came to one of our horse circles. You see, Mariah had horses in her younger days, and when they married. So, her love of horses runs deep. How honored I was when she came to the farm and lingered with the horses, during a horse circle. How thrilled I was to be in that space and place with her! I shall never forget it. 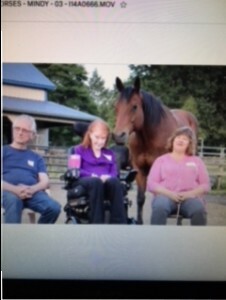 The horses were so tender and kind towards her, even in the midst of the sterile wheelchair. My dream was to get her on the back of a horse one last time. No easy feat, with all her limitations…by this point, she was strictly in a wheelchair. And yet, I held out hope. However, it was not to be. After a stay in the hospital, Mariah slipped out of this life. She was adored by thousands. She changed the lives of thousands. Her TEDX Talk,”Arrive Already Loved” can be viewed on youtube. It showcases beautifully how she lived her life. She leaves a wonderful husband, two adoring sons, and a grandchild. She leaves a legacy of guiding scores of people to greater freedom and truth. And, she does it by modeling one tenet-we are already loved. Right now, where we are at. In this moment. May you already love and know that you are loved-to all those in your circle of life, both two and four legged! That is what we at the Resonant Horse aim for each and every day! Events…stay tuned to meetup.com for upcoming horse circles. 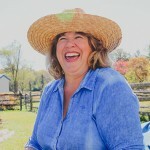 Mindy’s second TEDX Talk: “Love, Connection and a Horse”, while initially due to be presented on July 14th, has been changed. The date is now September 27th, still at the Figure 8 Barn in Wilmington. DE. That is a date you want to put on your calendar! It will be a stellar day of incredible speakers and visionaries. More information to follow! !